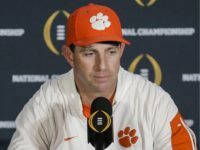 Clemson Tigers coach Dabo Swinney is speaking up in defense of several players accused of taking performance-enhancing drugs and saying that the school may have mistakenly given the substance to them, 247Sports reported. 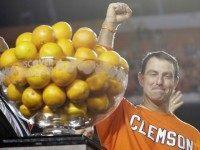 Clemson cruised to victory to a 44-16 win over Alabama to become the first 15-0 team in college football since 1897. 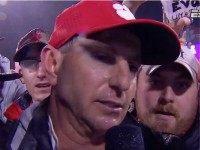 However, Clemson coach Dabo Swinney had praise for more than just his players, as he gave credit to Jesus for all of his blessings. 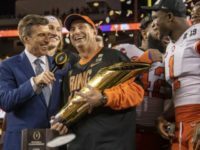 When the Clemson Tigers take on Alabama’s Crimson Tide for the Football Bowl Subdivision national championship tonight, at least one group will be watching for something other than the final score on the field. 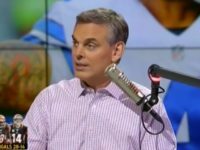 The College Football Playoff selection committee met Sunday morning and revealed its final rankings for the nation’s top four teams. 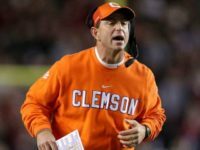 A year after his chaplain survived an attack from an atheist group for “arranging Bible studies, organizing devotionals and distributing Bibles and other religious materials,” Clemson football coach Dabo Swinney has been pressured to cancel an appearance with a pro-family group despite just 1,391 signing an on-line petition against his appearance.